Anthropology students participate in the Department of Anthroplogy's Field School in Fulton County, Ill.
Western Illinois University anthropology professor Andrea Alveshere will be hosting an Archaeological Field School Info Session Friday from 12 – 12:50 p.m.
Students who attended last years Field School in Fulton County, Ill. will be speaking about the experience they had in addition to answering any questions potential students may have. The event will be taking place in Morgan Hall Room 453 and students are encouraged to bring a lunch. The actual program will run from June 3 – July 26, 2019. 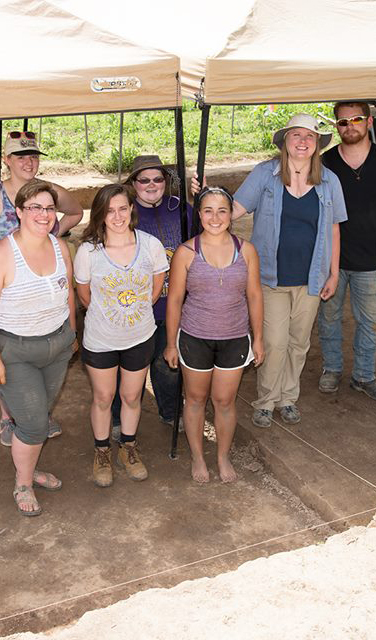 “The 2019 Western Illinois University (WIU) Archaeological Field School will focus on survey and excavations at the Orendorf and Rice Lake Terrace prehistori archaeological sites along the Illinois River in Fulton County, Ill.,” wiu.edu/anthropology/ fieldschool read. The Orendorf site is a Mississippian Village and mound group located on a bluff top that overlooks the Central Illinois River Valley and has been used by for excavations by Western since the 1970s. This year the selected group will be examining Settlements C and D which were decimated in a fire and abandon as well as access to Stettlement B which has never been excavated. This will give students the opportunity to better their knowledge on sequence, duration and character of the settlements. The Rice Lake Terrace site sits below Orendorf on the Rice Lake, an Illinois River backwater lake shore. The major duck hunting destination has recently been the subject of only very limited professional excavations until this year. If students decide to participate in the Field School, they can earn six credit hours for anthropology 325 archaeological laboratory methods and anthropology 326 archaeological field methods. In addition to paying Western tuition, the program also has a field school fee of $299, optional lodging at the Horn Field cabins for $299 and a non-refundable deposit of $100. The trip is overseen by Alveshere an assistant professor of anthropology who has been teaching at Western since 2013. Alveshere received her Ph.D. in 2012 from the University of Minnesota. She specializes in biological (physical) anthropology, archaeology, ancient/forensic DNA and forensic anthropology. The 2019 Info Session will be live-streamed at facebook. com/WIUFieldSchool and will remain on the page following the event for others to go and watch.